He looks like he’s cutting the grass with a vintage push mower. 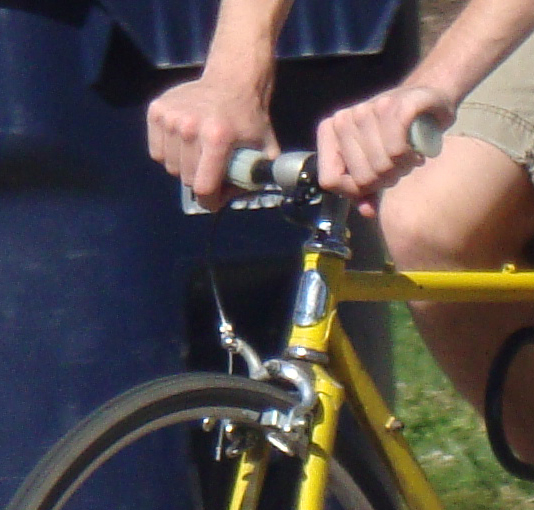 a) The length of one’s handlebars correlates to the length of one’s johnson. b) Sometimes this guy feels the need to shoot through a very narrow gap between a parked car and an LTD bus, and he doesn’t want any big, unwieldy handlebars getting caught on anything. True, these bars are actually narrower than his shoulders, but, you see, he can always twist his shoulders sideways as he goes through. c) It’s easier to get on the subway, this being Eugene and everything. d) All the cool kids are doing it. e) He has a hacksaw fetish. 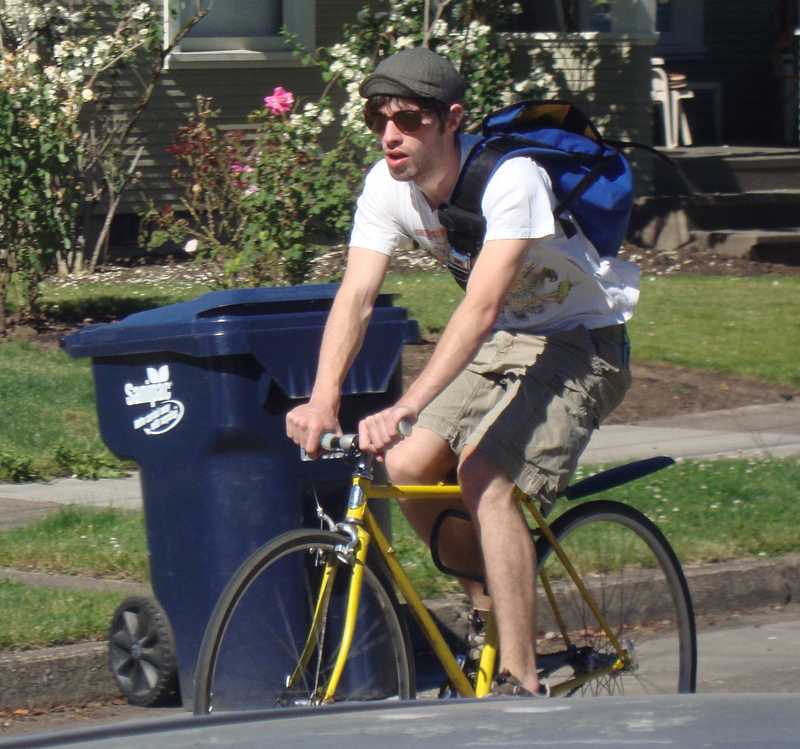 f) That’s all the handlebar he could afford after buying that brand new messenger bag. A hacksaw fetish does sound interesting. Add it to the list of others. actually he has at least a front brake. bars that short are semi-ridiculous,but do serve a purpose.they are good for passing through narrow openings and such.but sometimes it becomes too much.my bars are about 2 inches narrower than my shoulders,which works great.i used to have the 10 inch bars.i dont anymore.enough said. Great post. I’ll need longer bars just to hang on while laughing. Hey! That’s me! I don’t even care that you’re (maybe?) ragging on the bars. I love it when this happens — and people find themselves here. Glad you took it in good fun. I like to think I make fun of myself at least as much as I poke fun at others. Besides when I wrote this last summer, I think I was making fun of fixed-gears in general. Now of course, I have one and ride it all the time. Do you still have the short bars? Sure do, but I’ve shrunk my frame and wheels to match them. By the way, the answer is E.
… just stay away from my bike.